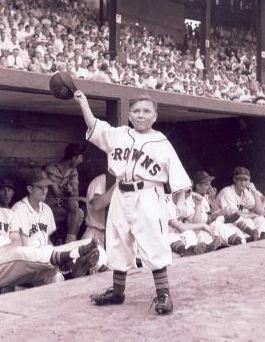 Today's honorary bat boy is Eddie Gaedel. CFJ was canceled yesterday while MTD discovered the true meaning of the day after Christmas. But we're back with plenty of Miguel Cairo talk. Yankees 4, Twins 3. One of NY's biggest projects coming in the offseason, besides alerting the authorities about my P.P.P. (Pantsless Pavano Protest) in February, was trying to get Alan James Burnett straightened out. So far it's working as the righty is 2-0 after tossing six innings of two-run ball. So we don't need the wagon and the padded room for Anthony in Poughkeepsie just yet. Also, Derek Jeter passed Rogers Hornsby for 33rd on the all-time hit list with a 2-for-3 day. I'm pretty sure we're the first site to mention that. Astros 3, Reds 2. The crowd of 20,014 included a walk-up sale of 6,301, presumably to see Matt Downs hit. Downs delivered, ripping the go-ahead double in the ninth to send Houston to its first win of the season and hand Cincy its first loss. Miguel Cairo just keeps padding his all star game resume: pinch-hit single in the fifth, .400 average through Thursday. "Edwin Jackson was humming, tellyouwhat. Johnny Damon-he gone! Matt Joyce-he gone! 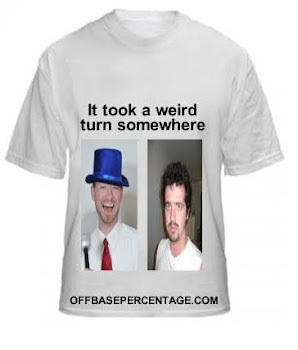 Ben Zobrist-he gone! Sean Rodriguez-he gone! 13 whiffs in all for Eddie Jacks and the Palehose offense got cooking right away. Juan Pierre with a duck snort in the first got things started, attaboy Juany. Then Alex doubled in Juany and Gordo. Later, Pauly singled in a run, attaboy Pauly, and the good guys added two runs late to keep the bad guys winless at 0-6. Today the Sox send Johnny Danks to the slab against Tampa. Come on, Johnny, little bingo." Indians 1, Redsox 0. Rafael Perez got the win and Chris Perez picked up the save for the 4-2 Tribe. In other Perez news: Horatio Perez went to the bathroom, Luis Perez replaced the light bulb in the bedroom closet and Manny Perez drove his uncle, Jorge Perez to his dentist appointment. Phillies 11, Mets 0. Brad Emaus: 0-for-4. Brewers 4, Braves 2. Dan Merklinger cleared waivers and was sent down to Double-A Huntsville Thursday, so I'm just a little too emotional to talk about this game. Labels: anthony in poughkeepsie, but could he figure out miguel cairo, Curveballs for Jobu, KenHarrelsonVoice, P.P.P.